Where is Bob? : The real deal....Opening Day in Fenton, with Laurin! The real deal....Opening Day in Fenton, with Laurin! This unedited video reflects the passion and energy that our operators have. For Laurin, this is a dream come true...but this dream was full of obstacles...none of which stood in her way. Laurin was approved as a franchisee based on our belief in her steadfastness....it is with great fondness that I have the opportunity to conduct this interview...it is with honor that I stand in front of her on opening day. Congratulations Laurin...you know who you are, and we love it! YOU ROCK! Congrats! You'll do great. Laurin - I got pretty choked up reading Bob's entry. "Those of us who travel further than the obstacles will know a different kind of life from that time on." Enjoy and celebrate this awesome accomplishment - I'm honored and proud to work with - and for - you. Laurin - the same determination that got you to opening day will be the determination that will make you a GREAT owner! Proud to serve you and couldn't be happier for you! Congratulations and best wishes. Hope you all have as much fun as we do Up North. Best of luck to you each and every day. You're the best!! All of your hard work and determination paid off. 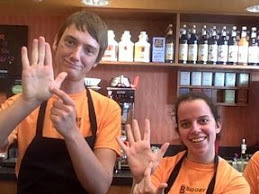 BIGGBY COFFEE would be lucky to have more franchisees like you. Congratulations to my Big Sister!! Laurin, you have traveled a very long path and right now we could not be more PROUD OF YOU!! Russ, Meg and I really wish that we could have been there for your big day, but once we come back home..you can bet that we will make a bee line to your store, not only to get some Great Coffee, but to also get a supply of some Ground to take back to Oregon with us!! WHOO HOO BIG SIS..YOU ROCK!! Well, it sounds like Opening Day was huuuuuuuge! That's great, and I guess no big surprise given the mob scene we had during the last two days of training week when we were giving away free drinks to give the trainees practice...boy did they get practice! Bob St. Mary's Health Care (SMHC) and the Diocese are creating a green space mall across from SMHC in Grand Rapids. Small shops will be in the development across the street from SMHC. How about a Biggby Coffee? 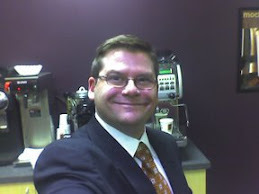 I am a great fan of Biggby and go there ALL the time. I work at SMHC and I was hoping this might be a good location for another store for you. smhc, I'll pass it on to Sandy Green (real estate guru) and the GR operators...thanks! Congratulation on your opening! We now know the "pain" of the interview! Best wishes for a busy summer! Laurin! What a surprise!! I was browsing the website and saw your video. Congratulations girl! Good luck and come see me again for your hair!! I'm Back...and I'll be on the road again! Vote about change...is it time for some organic? Tip it, tip it good!